We recently commissioned a research study on Help Desk plugins by hiring an experienced WordPress plugin reviewer to provide in-depth reviews of the top 8 WordPress Help Desk plugins. 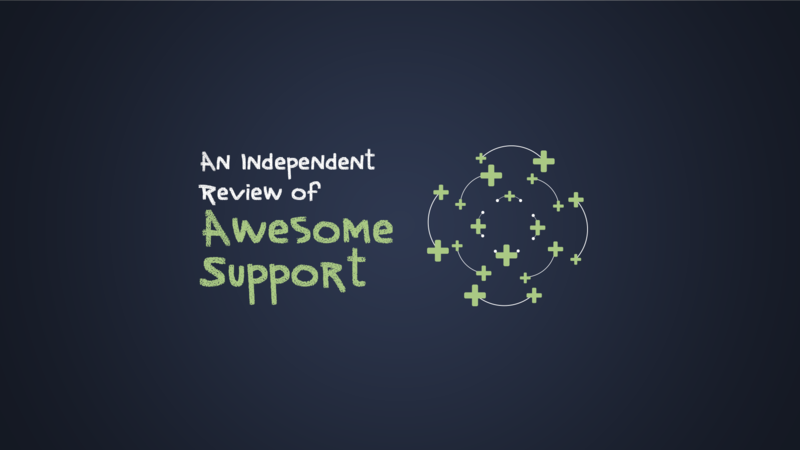 Of course, Awesome Support was included in the review. Below is the Awesome Support excerpt from the WordPress Helpdesk Ticketing Plugins 100 page e-book. Note: The start of the review will sound a bit unusual but that's because its an excerpt of a far larger body of work that spans about 100 pages. Last, but by no means least, is Awesome Support. Like some of the previous offerings, Awesome Support is a free core plugin with a variety of premium addons that tack on additional functionality. But Awesome Support takes things a little further by giving you full flexibility over how your front-end forms work. Let’s start with custom fields...Awesome Support lets you choose from 11 different possible custom field types, including helpful advanced options like taxonomies and password fields. Specifying whether changes to a field should be logged on a ticket – great for audit trails! Like the other plugins, Awesome Support includes a single help desk form and all custom fields are shown on that form. And, at first glance, it might seem that there is no ability to create other forms – which would be the functional equivalent to other plugins. Instead of building yet another form builder, Awesome Support opted to sync up with one of the most popular form builders out there – Gravity Forms. 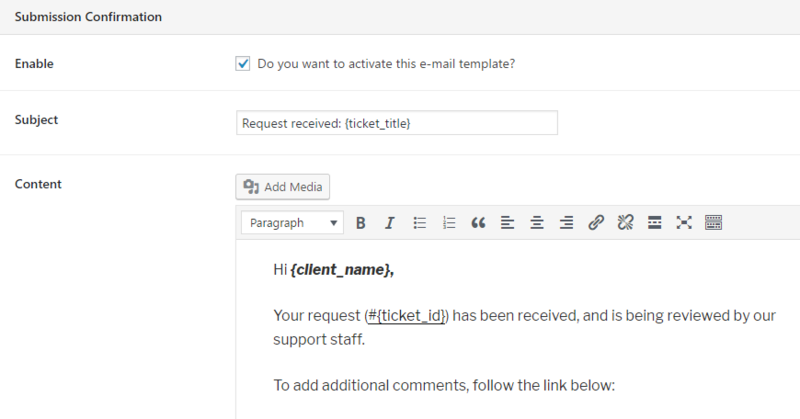 With this connection, you can create as many custom ticket forms as you need and link Gravity Forms fields to the custom fields you created in Awesome Support. And you can also take advantage of all the core Gravity Forms functions like user registration, Zapier integrations, and more. And because Gravity Forms includes sophisticated options for conditional processing and hooks into the WordPress API, it’s easy to control how tickets are assigned and who they are assigned to (more on this later). By hooking up with Gravity Forms, you have a great deal more flexibility than pretty much all the other plugins in our comparison. And, with some simple CSS, hide sections of the form that you do not want. 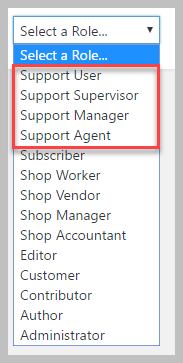 Whereas with most of the other help desk plugins you get somewhere between zero and one ticket assignment algorithms, Awesome Support ships with five separate algorithms that you can use to define how tickets are assigned. IF NO AGENT IS FOUND - look for any agent who is working regardless of product or department. With five separate algorithms, you can find the specific uses that work for you. 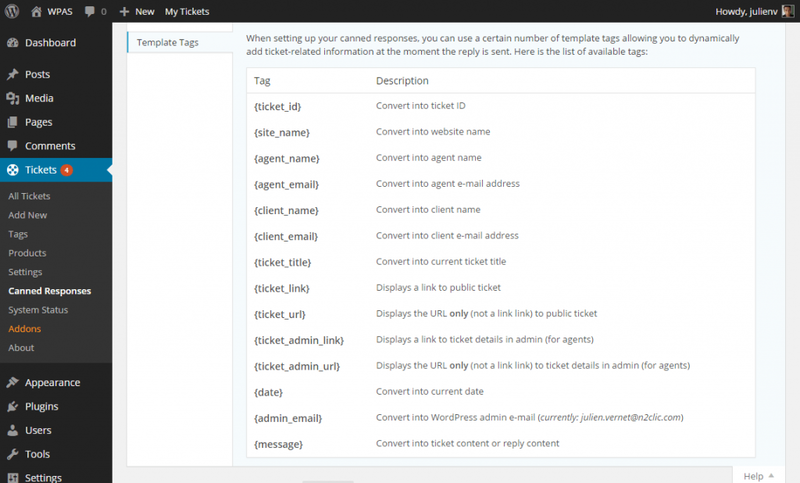 As far as we know, no other WordPress help desk plugin offers such detailed ticket assignment. So really - you have full control over every single column that appears on your ticket list. Additionally, Awesome Support ships with some agent-specific organization features that can help boost your team’s productivity. For example, individual agents can create their own to-do lists which can help agents keep themselves organized as they handle a flurry of tickets. While Awesome Support also lets you respond to tickets via email (more on that in a second), we’ll focus on the backend interface for this section. Awesome Support gives you a few different productivity tools when crafting your responses. First off, you can always add private internal notes to tickets. 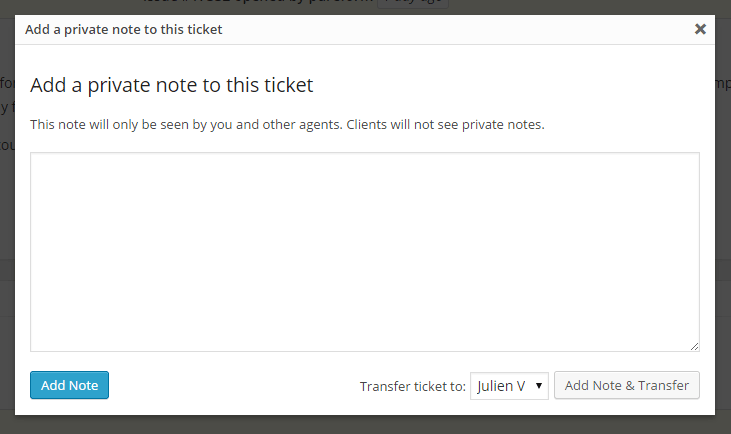 And one of the most helpful features here is that you can leave a note and transfer the ticket to another agent...all in the same action. Just because a response is automated doesn’t mean it needs to look like an automated response! With these tags, you can, say, address your customers by their first name, even if you’re using a canned response. In addition to canned responses, each agent can also have their own personal signature to add an even more unique touch (without adding to the time it takes to respond to a ticket). And one feature you’re unlikely to see in many other help desk plugins is the ability to merge or split tickets from the ticket response interface. With this feature, you can, say, split a specific ticket response into its own unique ticket, a great solution for complicated problems that require multiple different tasks to be completed. Similarly, you can also do the converse and merge two tickets together if the issues are duplicated or otherwise related. If needed, you can pull in emails from multiple mailboxes and automatically add specific priorities, channels, products, and departments depending on which email address a ticket came from. Most other plugins don’t even let you use multiple inboxes, let alone tag each mailbox with specific information. Email inbox rules are a powerful feature that can greatly boost the productivity of your support team, all while allowing your team the flexibility to work via email instead of the standard interface. When it comes to email notifications, Awesome Support sets you up with 5 different base notification emails plus additional possibilities for each custom status that you add. The custom status notifications trigger on changes so that, for example, notifications can be sent to a business owner if a ticket has its status set to “ESCALATED”. For all the emails, you can edit the template and use dynamic tags to insert real data. You can also add custom headers and footers that apply to all templates. Beyond email, you can even notify users and agents via SMS, which is great if your business operates in an especially time-sensitive industry. Additionally, another unique feature of Awesome Support is the ability to set up alert emails for third parties who aren’t directly part of the ticket. With this feature, you could, say, set up an email alert on a ticket for a small business owner, even if one of their employees is the actual author of the ticket. Unlike all of the other plugins, Awesome Support does include a private credentials vault that allows your customers to submit sensitive data with additional encryption. Additionally, any data stored in this field will be automatically deleted when the ticket is closed to ensure that unauthorized users never have a chance to get their hands on it. If you care about your customers’ security, you need to take extra steps to keep their credentials safe. Awesome Support lets you do that. But, going along with the deep functionality theme, Awesome Support also includes more than 30 internal security ids (called capabilities in WordPress terminology) mapped to four predefined roles. Each capability can also be assigned to any new or existing roles. Practically speaking, it means that you can control whether agents see their own tickets or all tickets, which drop-down list (taxonomy) they can edit and even which menu options they can view. You can, for example, allow some agents to add/edit/delete ticket TAGS but prevent them from changing predefined PRIORITY levels. Other agents functioning as supervisors can be allowed to change Canned Responses and FAQs. There’s also one more helpful security feature related to the master ticket list. You can configure SECURITY PROFILES and assign them to agents to truly lock down which tickets they can see. Or to expand the tickets that they can see. 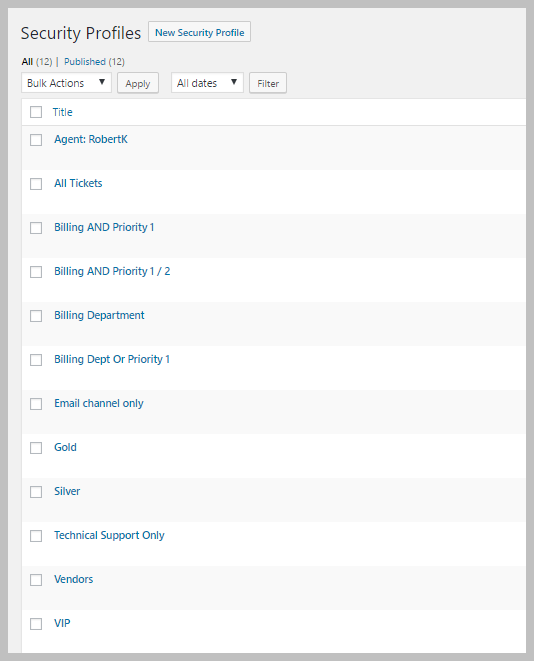 For example, you can create security profiles for agents to only handle PRIORITY 3 tickets from the SALES DEPARTMENT. Or you can create a security profile for an agent to only handle tickets tagged as VIP regardless of which other agent the ticket was assigned to. If you routinely accept support requests from "untrusted" sources such as phone calls, chats and non-ticketed emails you also have the the option to use PINS (personal identification numbers). From what we can tell, no other WordPress HelpDesk plugin has this feature. With it, each support user gets assigned a 4 digit number that is only accessible from inside the support account. An agent that receives a phone call can ask for the PIN to verify that the caller does indeed have access to the support account. Its another layer you can to your security layer. 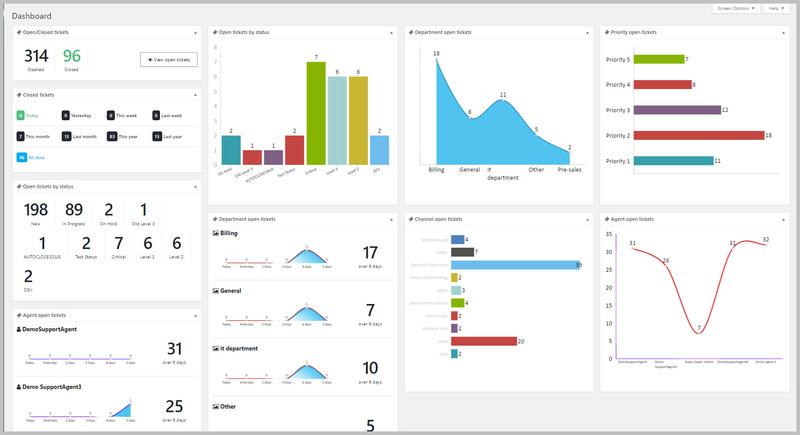 By utilizing individual report widgets, you can create a data dashboard that gives you a high-level overview of everything you need to know, and nothing you don’t. And if there are any reporting widgets that you don’t need - just remove them and focus on what’s important to you. For widgets with charts, you have complete control over the type of chart (choose from up to 9 charts, though maybe, only 5 are really practical for the small display space), colors, line size, x-axis control, and lots more. By dragging and dropping the widgets around on the WordPress admin dashboard you can create a very powerful help desk decision making console. But, if you need more information than the basic widgets can offer, you can also dig into the advanced reports and statistics. Ticket counts - see how many tickets you have by each status. Productivity analysis - shows the average, median, and maximum number of replies needed to close a ticket. 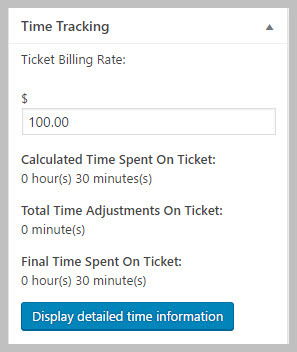 Resolution analysis - shows the average and median time it takes in minutes to resolve a ticket. Delay analysis - shows how long, on average, it takes to send the first reply to a ticket, as well as all subsequent replies. 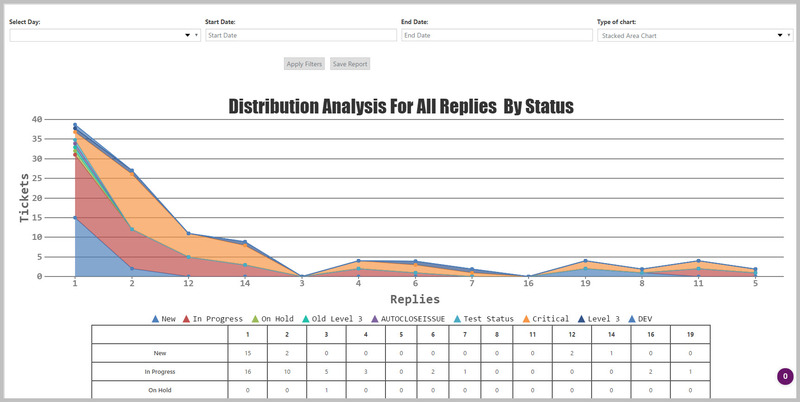 Distribution analysis - shows the number of tickets that contain 1, 2, 3,...N number of replies. Trend analysis - displays the number of tickets opened/closed over a time period. As far as we know, no other support plugin has such detailed analytics. And the truly important thing is that these analytics can actually help you improve the productivity and success of your support center. 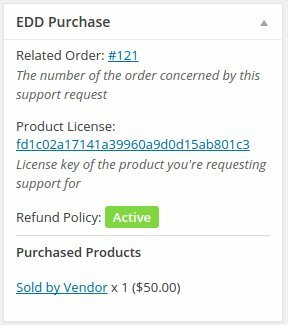 For WooCommerce, the user can log into their WC account and click a HELP button right next to their order to open a ticket. With Easy Digital Downloads, integration with their licensing module allows you to optionally restrict tickets to only licensed users. 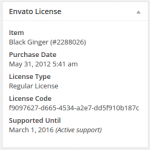 And with Envato, you can force a user to enter an Envato license number that is validated before a ticket can be opened. Each module has additional functions specific to its corresponding vendor. For example, EDD has a field that shows the lifetime value of a customer – this is shown on a ticket so that an agent can see how much the customer has contributed to the business which helps them to keep their biggest customers happier. Awesome Support also gives you some other unique management tools to improve your help desk’s productivity. We’ve already mentioned Splitting and Merging tickets above, but you also get some other helpful tools. For example, you can set up both limits for active and overall tickets. This means that you could set up a restriction to only allow a user to have a maximum of, say, three tickets open at one time. Or, you could allow a max of 25 tickets total per user to prevent users from abusing free support. There is also something called Ticket lock that prevents users from re-opening a closed ticket. The ticket can be locked manually by an agent or automatically when its closed. If you’ve ever been frustrated by users who reopen really old tickets this feature can really nip that behaviour in the bud. Automatic Ticket Close works in the background to send customers warnings about open tickets. When conditions you specify are met, tickets that haven’t had a customer response are then automatically closed. This allows you to focus most of your attention on tickets that are truly active. One cool thing you can do with this is to use it as simply a customer reminder mechanism – you aren’t actually forced to create a ticket-closing rule. 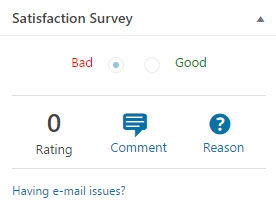 Used incorrectly, satisfaction surveys can quickly annoy customers. But used properly, they can provide feedback and alert you early on to potential issues with your help center. Awesome Support offers four types of surveys including the popular “quick-link” surveys at the bottom of every email the customer receives about a ticket. These are usually the most effective and will likely result in your customer proactively closing tickets and assigning a rating since they can do both with just one click. The results of a survey for a particular ticket are shown directly on the ticket. Sometimes you just want to reduce the friction involved with entering a ticket. A new user should be able to enter a ticket without first registering on the site. Awesome Support admins have the option to allow a new user to create a ticket without first creating an account. “Guests” can then interact with the ticket via email and, with the addition of certain links to the email alerts, they can even close and rate tickets without having to log into the help desk system. With the Notifications extension, you can set up alerts for Slack and Pushbullet. That way, your whole team can get a Slack notification when a new ticket rolls in. One way Awesome Support can save you time and lessen your support load is through its FAQs and Public Tickets features. With FAQs, you can quickly take any reply and make it into a FAQ entry with just a few clicks. Public Tickets, on the other hand, make the entire ticket public, which is the absolute quickest way to make information available to all of your customers. Of course, if you take advantage of this optional feature, you should always make sure your customers are aware that their ticket responses will be publicly available. Customers don’t always want to take the extra step to log into your site to close tickets. So Awesome Support includes an optional tag that can be added to every email giving the customer a single-click option to close the ticket. The plugin has an optional drag-and-drop interface for uploading files. When the interface is used, the files are stored in the cloud using a service called FilePickr – effectively off-loading them from your web server. But it also allows you to configure things so that the user can upload files directly from Dropbox, Facebook, Evernote etc. And, of course, you can limit the type of files allowed. Automatically record the time spent for each reply to a ticket. Specify a minimum amount for each time entry. Set billing rates at the agent, client, and ticket levels for easy invoicing. Configure which specific agents count towards billable time. If you need to bill clients for the specific time you spend on support, we don’t think you’ll find a help desk plugin with anywhere near the time tracking depth offered by Awesome Support. Ensures you’re operating in a familiar interface (the WordPress dashboard). Allows you to add custom styling via admin themes without negatively affecting the plugin. If you’re not a fan of the core WordPress aesthetic, Awesome Support has guides that can help you re-style the admin to create a white-label looking help desk. You can download the core plugin for free from WordPress.org. While the free version is a functional and solid helpdesk, if you’d like access to many of the features we discussed in the preceding sections, you’ll need to purchase some of the pro addons. You have two different ways to expand the functionality of the free version of Awesome Support. First off, you can purchase individual addons on an “a la carte” basis. If you just need a couple of addons, this might be your best course of action. Join our e-mail list and get a free add-on for Awesome Support worth over $60.00. Thank you for signing up - check your mailbox for more information! THREE EASY WAYS TO GET STARTED WITH AWESOME SUPPORT TODAY!